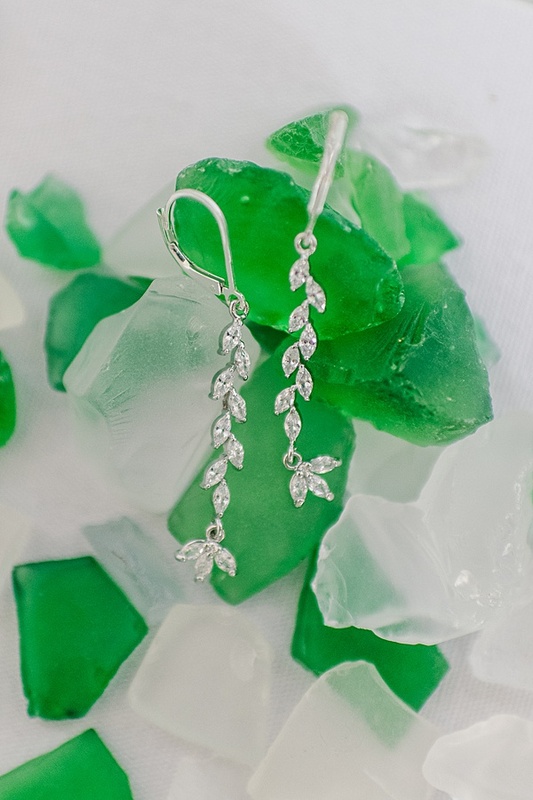 Our Crystal Vine Earrings have been on quite the transformational journey! Pictured above is their third iteration. 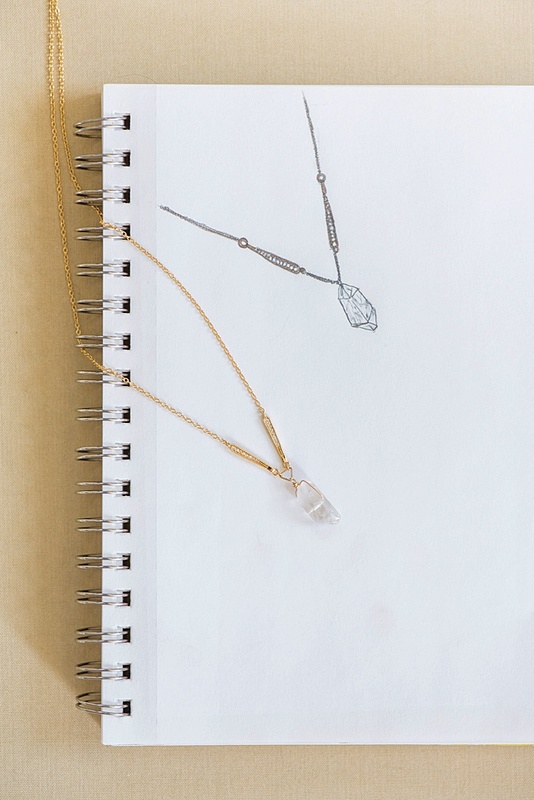 Here, the crystals are wrapped in silver and feature a leaf triad instead of the opal drop of earlier versions. 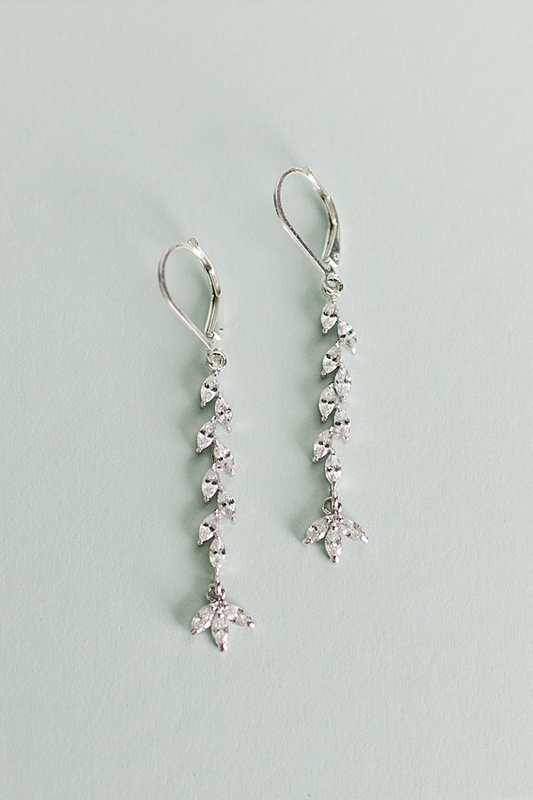 New J’Adorn Bride Sarah saw these earrings (in their second version) on our Instagram feed and fell in love. 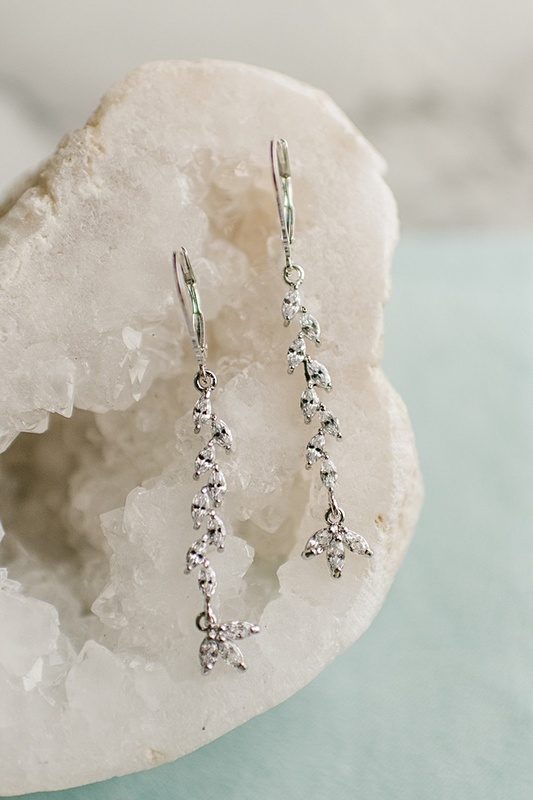 This second styling of the Crystal Vine Earrings were for Portland Bride Ari. Hers was the wedding that almost wasn’t. 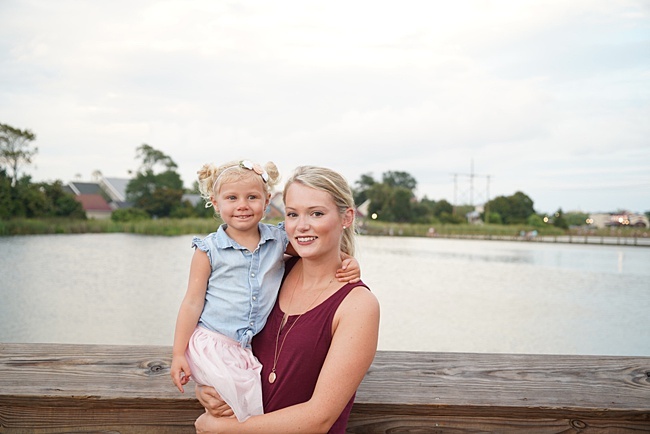 We covered her heartbreaking/heartwarming story on the blog just a few months ago. AND… Ari’s earring aren’t quite ready to nestle in the jewelry box just yet! 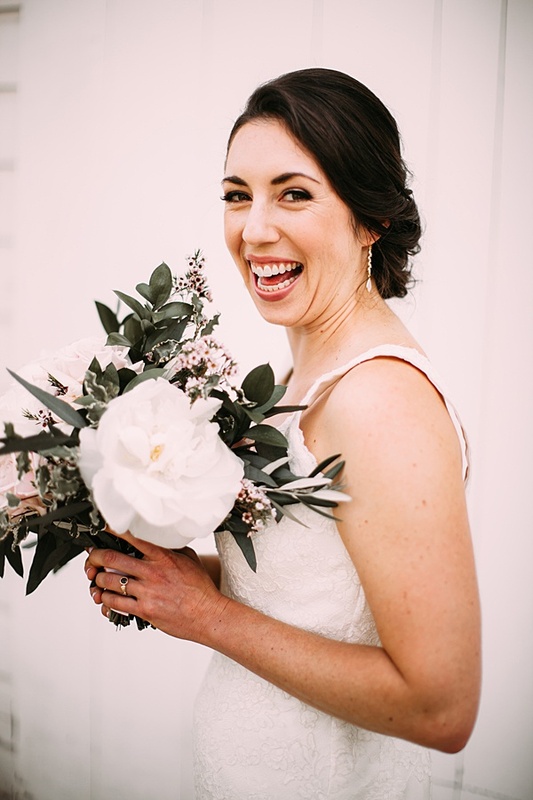 Her best friend loved them so much, she’s using them as her “something borrowed” for her upcoming wedding later this year. In the journey of these Vine Earrings, Instagram strikes again! 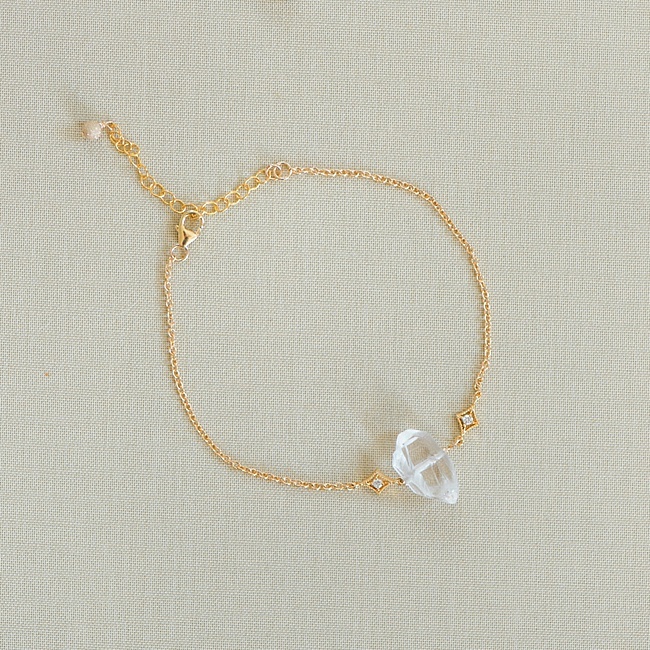 Ari saw J’Adorn Bride Rachel’s version, which inspired her to customize her own. Bride Rachel (who lives in Germany) loved the look, but needed a shorter version. She worked with Designer Ali, who recommended a shorter pear shaped opal drop, via email to create the perfect pair for her wedding day. We’ve got all of those details, including shots of her matching bracelet, here on the blog. So, from the original pair in our Jewelry Shop, to Germany, then Portland and now to Ohio, we just love seeing this vine grow and grow! Bride Sarah asked if they could be made in silver and with no drop (just the vine). Ali recommended adding the leaf triad to make the piece feel more complete, and Sarah agreed. Delicate & Sparkly – the silver maximizes the shine factor! Lever-back Closure – so dance your shoes off and know your earring will stay put! Which pair is your fave? AND… What will these earrings grow into next?! Let us know what you think in the comments. 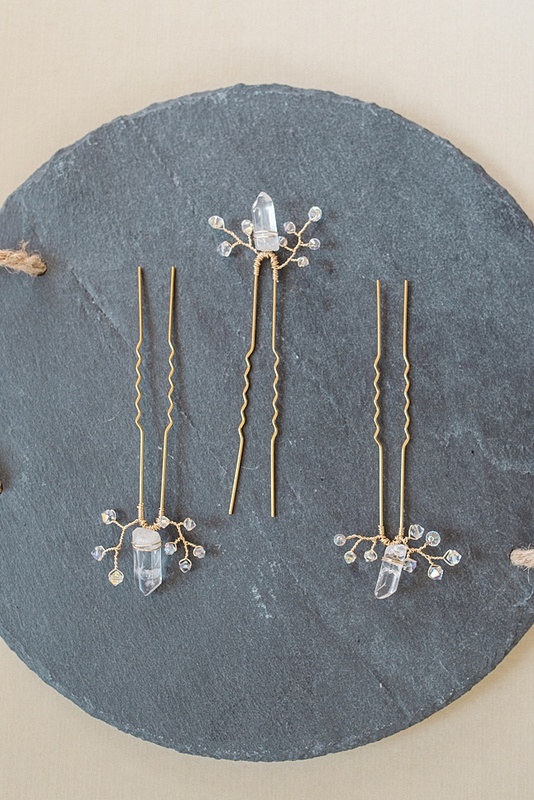 We just can’t get enough of these Crystal Vine Earrings. At the J’Adorn Designs signature Tassel Bar event, you get to play the role of designer and build the perfect pair of tassel earrings. Or two or three… we won’t judge! Last month, in early February, we launched our first ever Tassel Bar event. This fun pop-up event is one that we are hoping to bring to our stockist locations and other local boutiques this spring and summer (and beyond). So, if you’re a local business owner (think: boutique, salon, studio, coffee shop, etc. ), TAKE NOTES! We want to partner with you and bring this fun and colorful experience to your venue. 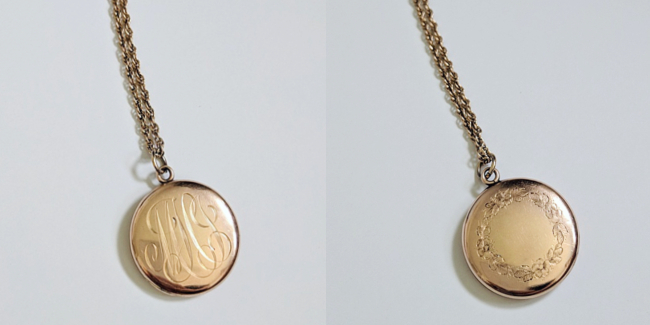 Never designed jewelry before? Don’t worry, we’ve made it easy for you! 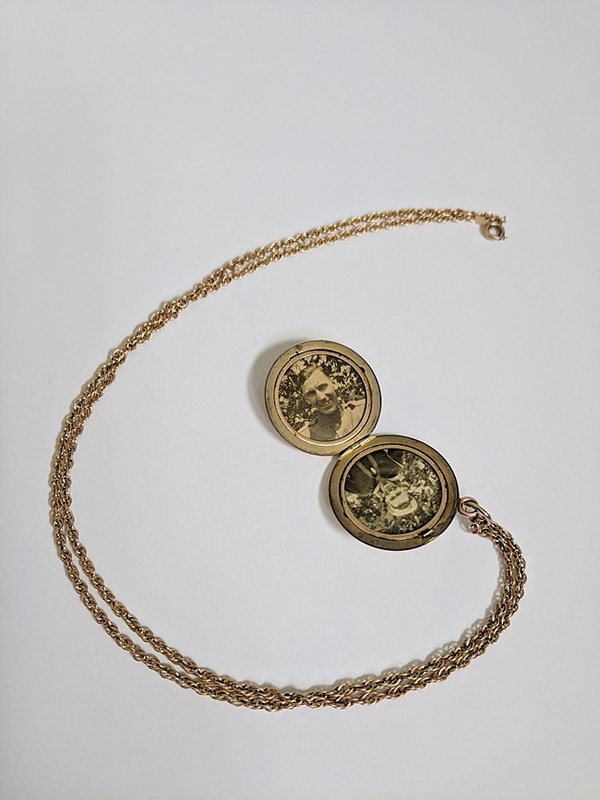 For future events, we are working towards building the earrings on-site, so that those who place their orders early enough in the event will be able to take theirs home that day! Of course, building the tassels you design takes time and care, and if we’ve got a queue of orders, we may not be able to fill them all during the event. The early girl gets the jewels, as they say! 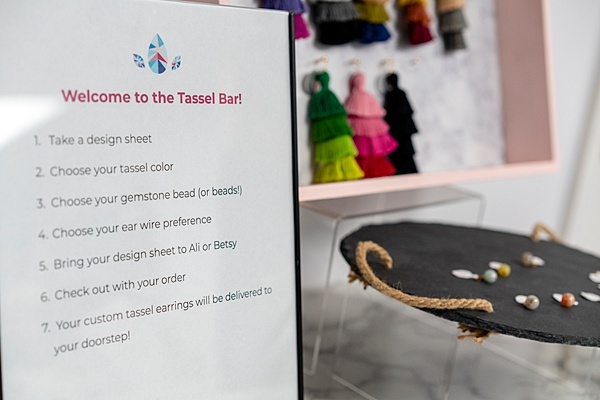 We’ve blogged about our Tassel Collections before in the spring and fall of last year, but this Tassel Bar Event is something totally brand new. 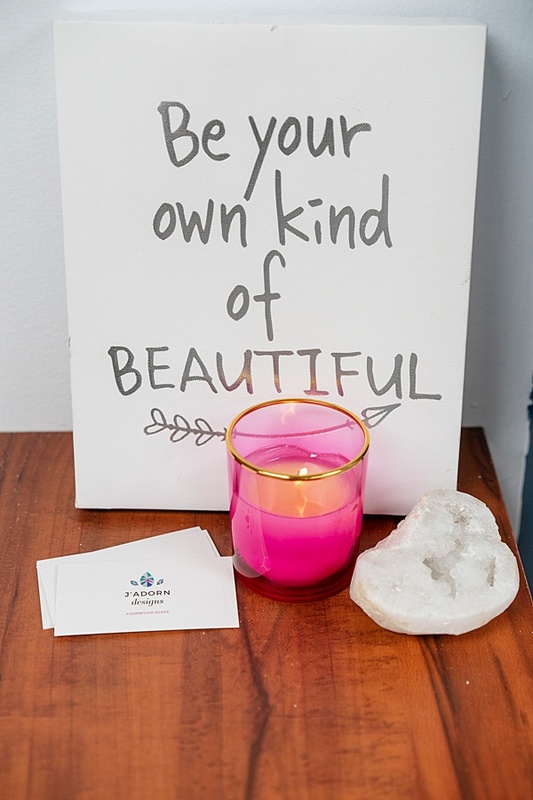 Our Launch Event boasted a complimentary lip-color bar (complete with professional makeup artist), several kinds of bubbly, chocolates and a photo booth. 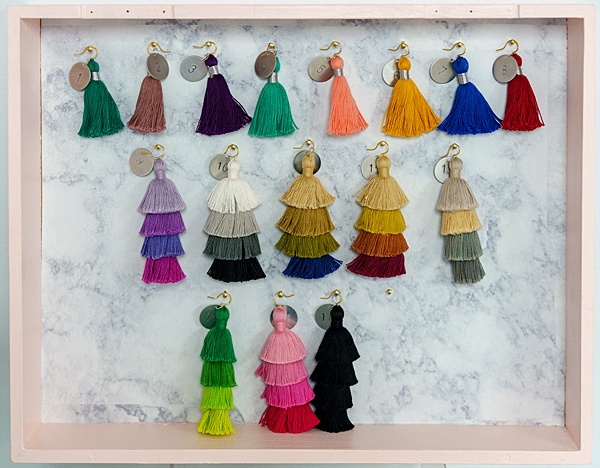 These tassels just inspire FUN. So, you can be sure that any future Tassel Bar event is going to be packed with exciting experiences! 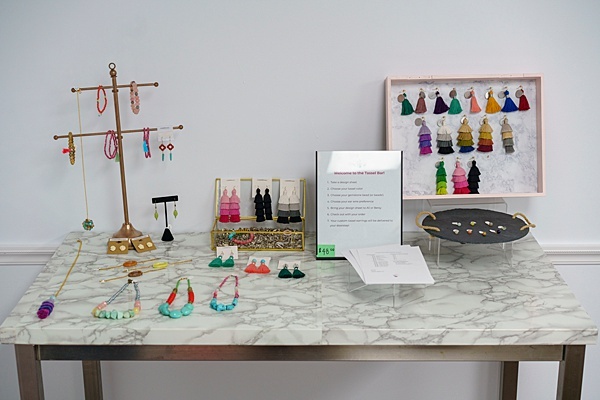 In addition to our Tassel Table, this event featured a pop-up of our other jewelry collections, too. Our druzies are always so loved and we were happy to show off some of our newest designs! 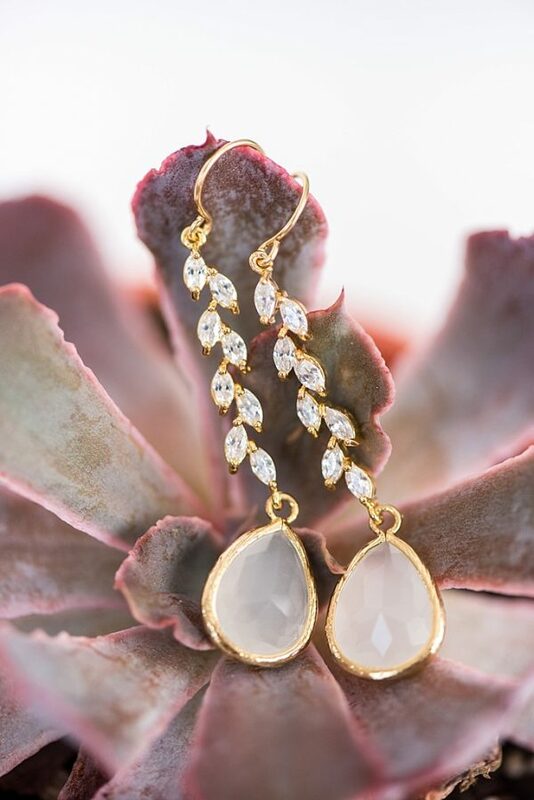 Can you spy the new WHITE DRUZIES with rose quartz drops? 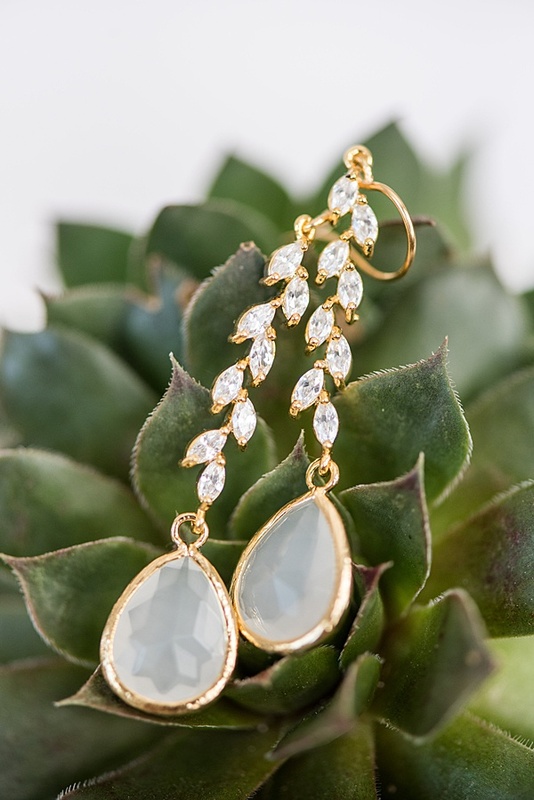 Also, those Lemon Quartz Branch Earrings are another fan-favorite. And be sure to stay tuned to our social channels… you may see them popping up in a couple new colors soon! Have a special color you’d like to see them in? Let us know in the comments OR contact us here! With spring just around the corner, our bright and cheerful tassels have us dreaming about warm, dusky evenings and blooming flora. And, wedding season, of course! We’ve recently had a couple spring bridal clients place orders for tassel earrings to gift to their bridesmaids (umm… best brides EVER!). Consider us your one-stop-shop for adding all the finishing touches to your wedding look AND celebrating the best friends who’ll be standing with you on your big day. So, stay tuned for lots more Tassel Bar events popping up in Central Maryland (and the eastern shore) this year. Don’t live nearby? No sweat! We’ve got lots of beautiful tassel earrings in our online jewelry shop. And if you don’t see the color combination you’re dreaming of, let us know. We take the “custom” part of our brand very seriously! And, local business owners, let’s work together to bring the fun to your venue! There are perks in it for you, too… just ask us! Ari & Bryce’s wedding almost didn’t happen. A terrifying and near-tragic accident almost put the day on hold. But, this resilient couple didn’t let anything, not even rocks, stand in the way of tying the knot! Rocks have played a major role in Ari and Bryce’s relationship. They met in 2014 at their local climbing gym. 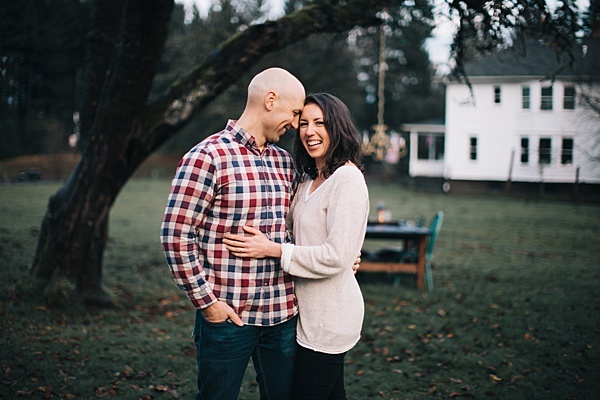 Despite their busy schedules (Ari as a nurse practitioner and Bryce as a law student preparing for the Bar), they ran to the mountains every free moment they had and fell more in love with each new adventure. 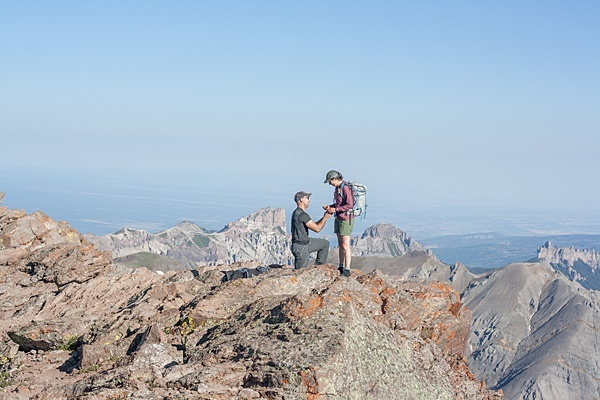 After Bryce passed the Bar, they headed out to Colorado for some serious rocks, adventure and a surprise proposal on top of Uncompahgre Peak! 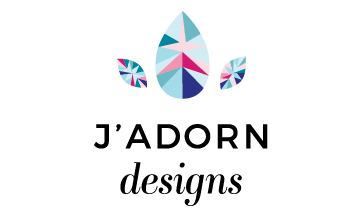 She saw the custom earrings we made for another J’Adorn Bride and asked if we could recreate a pair for her. We were thrilled to revisit the design. 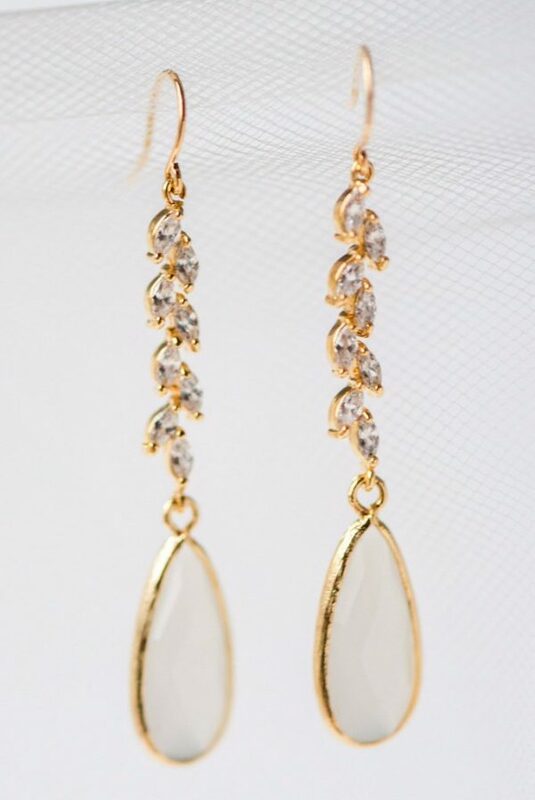 Her earrings are a custom twist on the Gold Crystal Vine & Opal Teardrop Earrings we carry in the Jewelry Shop. Two weeks before the big day, with the details well in hand, Bryce and his groomsmen headed out to Smith Rock State Park for a weekend of climbing the rocks. On their last climb of the trip, Bryce took a 40 foot fall and sustained injuries to all four of his extremities, which left him temporarily wheelchair bound. Miraculously, he did not suffer any permanent spinal or brain injuries! But, with just a handful of days to go before the wedding, his surgeon suggested they consider postponing the big day. After a quick breakdown (because, of course, how heartbreaking! ), Bryce and Ari decided that delaying their wedding just wasn’t going to be an option. And their family and friends rallied around them to make sure their day would happen! 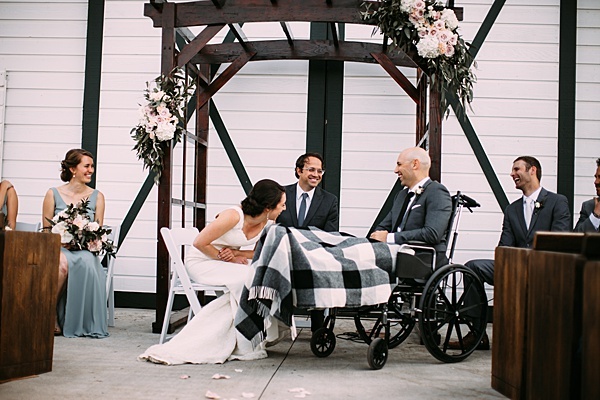 They held their rehearsal dinner at the skilled nursing facility where Bryce was recovering, and with the help of his brother, Bryce and Ari were still able to have a first dance… wheelchair and all! 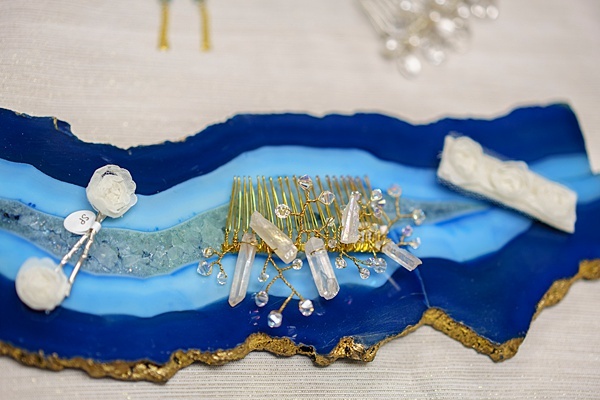 We feel so honored to have one of our pieces play a small role in the kind of wedding that reminds us all that weddings are about celebrating the beginning of a real flesh-and-blood life together. A life of ups and downs, of betters and worses. And NOT about the details of throwing a party. 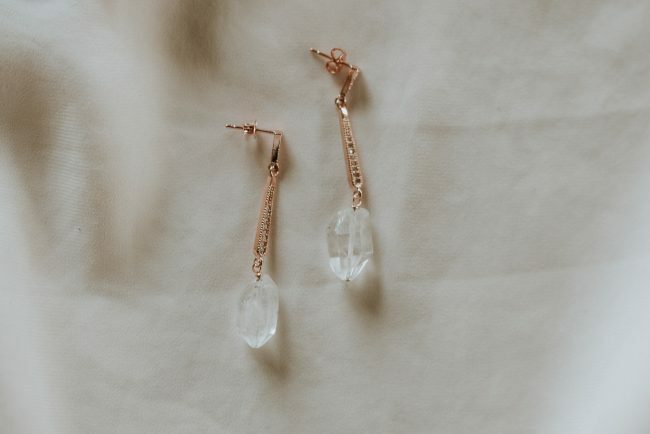 We are especially tickled to learn that Ari’s version of these Gold Crystal Vine & Opal Earrings were so loved by one of her best friends, that she will be using them as her “something borrowed” for her upcoming wedding! If Ari & Bryce’s story captures your heart the way is has ours, go ahead and check out their wedding video. Bryce’s cousin (Kyle Vandever Productions) created it to share their beautiful story. 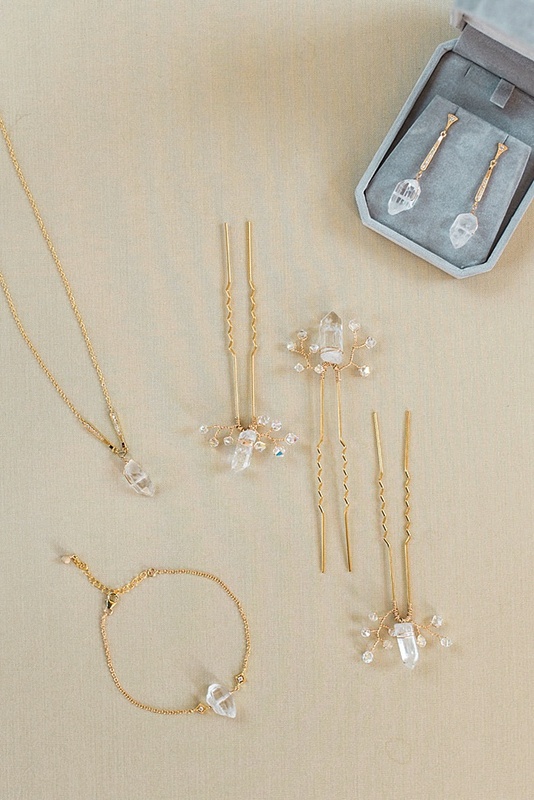 Today, we’re showing off the custom set of bridal jewelry we created full of vintage vibes and stunning raw crystals. Bride Kylie found us on Instagram. 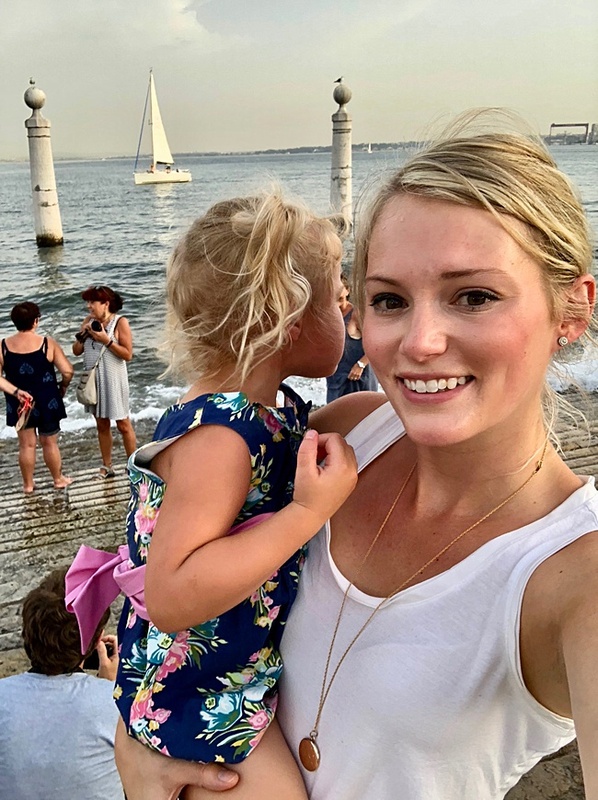 She fell in love with a post featuring our Deco Rose Gold Bridal Earrings, but the metal color wasn’t exactly right for her. She reached out to us to see if it would be possible to get them in yellow gold. And as a custom jeweler, our answer is (almost) always YES! What started as a request for customized earrings quickly grew into a full custom set of bridal jewels. 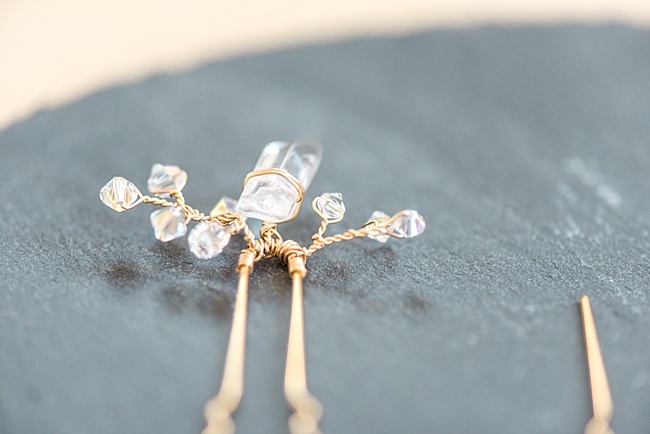 The raw crystals paired with a vintage style came together in the most romantic way. Notice the vintage details in these pieces! 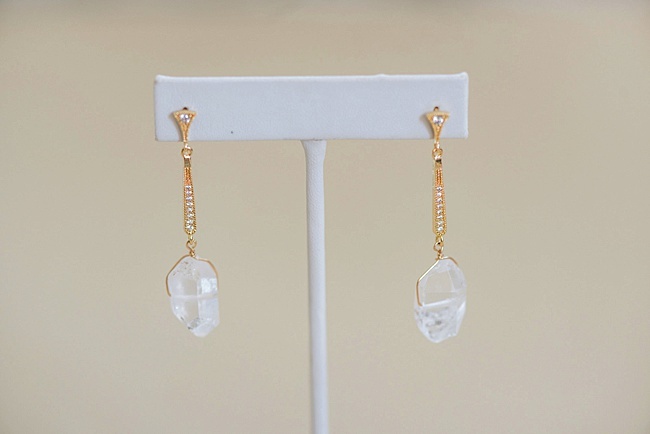 From the warm, yellow gold and deco-style embellishments inspired by the original earrings that caught Kylie’s eye; to the rough clear crystal quartz points and the more delicate clear Swarovski crystal “sprouts” (our signature element). 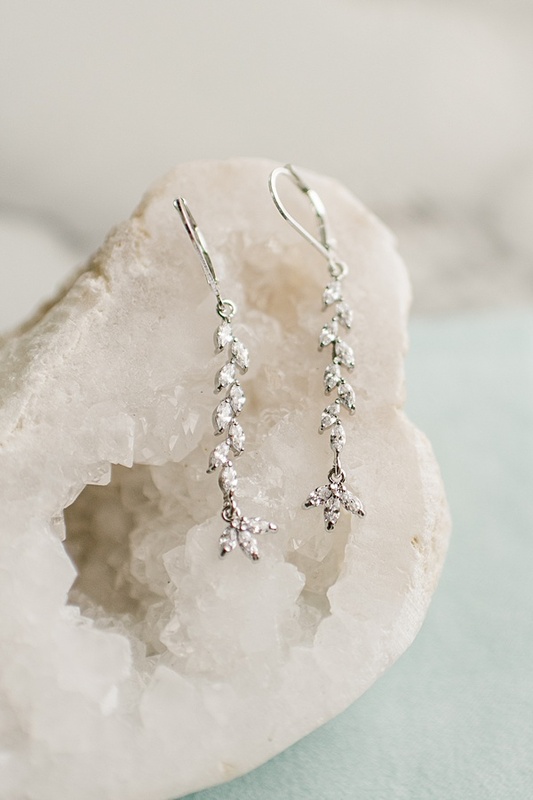 This set gives us all the romantic vintage wedding feels. 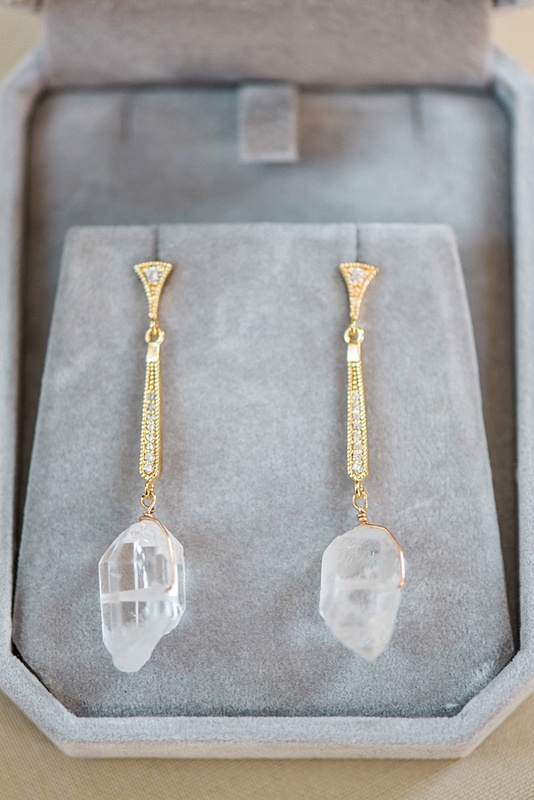 And we think raw crystals might be the most lovely wedding jewelry element since pearls! And, in a time when rose gold is having a moment and white gold has been the standard, these warm yellow hues are refreshing (and just the right way to keep that vintage vibe). This bridal set has got our design wheels turning as we think about the next bridal collection. 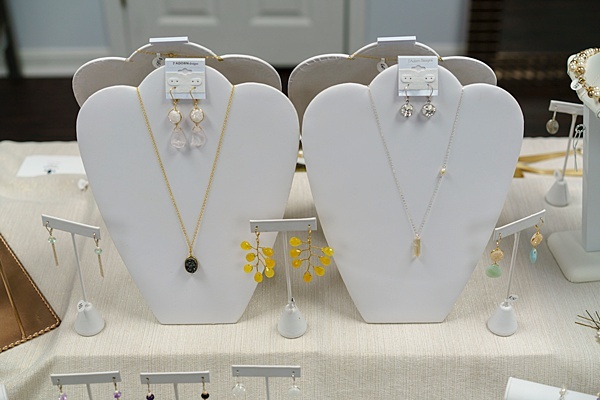 Would you like to see any of these pieces make an appearance in the Jewelry Shop? Tell us in the comments!